I've rather enjoyed Paul A Lunn's series of articles in Railway Modeller proposing micro-layouts, obviously enjoying micro-layouts myself I was pleased to get his book on the subject. It contains a selection of ideas similar to the articles in RM, with some attractively illustrated plans. To my mind many of the plans verge on the gimicky, with extremely short trains (30cm in OO gauge?!) and much use of traversers, sector plates and loco lifts in the operation of them - personally I prefer layouts with slightly more prototypical operation. Also I thought the text could have been more in-depth in places, explaining construction and operation better. However there are some great ideas, and the first section of the book gives good tips on designing small layouts. The biggest omission to me though was Narrow Gauge - using NG is extremely popular in building micro-layouts, so it seems odd that it is not even mentioned. I guess the book is aimed at the mainstream, RTR-using modeller (all plans use OO scale), but scales such as 009 and O-16.5 are established and popular and given the subject of the book I think they should at least have been suggested. This is another book of plans by Iain Rice, and those that have read his other books on the subject will find no surprises here, just lots of great ideas for layouts in a variety of spaces, all with good scenic and operational potential, and well-illustrated and explained. Some may not like his style, and not all his ideas will suit, but his approach to layout design has inspired me over the years. And yes, there is even a narrow-gauge plan! A friend of mine is a big fan of the Sittingbourne 2'6" gauge railway and is planning a layout based on the Bowaters Paper Mill. I know very little about this system so when I saw this book by David Hammersley at EXPO-NG I had to get a copy (although the elves came and took it away so Santa could deliver it!). As the name suggests it is packed full of photo's, showing the atmosphere and detail of this industrial narrow-gauge empire, with a number of colour photos too. The captions are informative as is the brief introduction to the line, overall a great book for the narrow-gauge and/or industrial railway enthusiast, and for any modeller! Wishing you all a Happy New Year, and hoping for some more productive modelling! OK, so I still haven't had much time for actually doing any modelling! Various other distractions, including small children and their usual tendency to pick up any bug going, and the usual pre-Christmas nonsense (why do we spend weeks preparing for one day? ), have got in the way. However I do have a few projects lined up for the new year. Meanwhile I thought I'd show some photos of some friends' work-in-progress, which have inspired me. 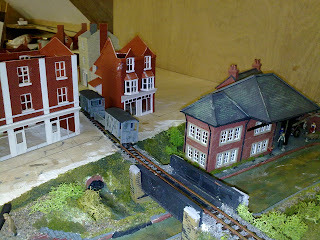 Mark Holland is building a model of Welshpool, he showed this at the Haywards Heath club show back in March, at that point he had only just got the station and yards to a reasonably complete state. However at a recent club-night he brought along the next board which contains the line winding through the streets and back-yards of the town. Now Mark calls the layout "Spirit of Welshpool" as he does not claim it to be an accurate representation - indeed a lot of selective compression has taken place and a few landmarks have moved! - but nonetheless comparing the under-construction town scene with old photos in books it is instantly recognisable. 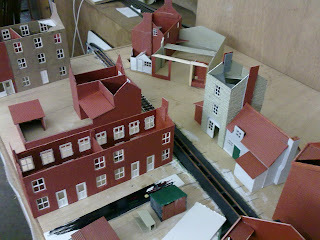 Bear in mind that this is only Mark's second model railway layout, to embark upon such a model is quite a feat! This is where the line crosses the canal, and then Church Street, and dives between the shops. These have lighting and will be fitted out. 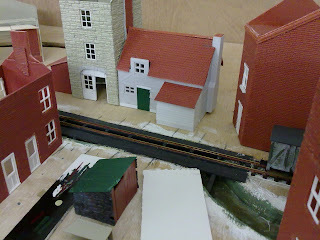 The canal wharf has been "moved" to add interest to the scene. In the background is the garage, where cars always seemed to be parked inches from the loading gauge of the passing trains! The church would be to the right. Mark has based the buildings on old and modern photos of the area, although they are not accurate representations and many are missing, it really captures the atmosphere already. There's a lot of work left to do though! Incidentally, these photos were all taken with my latest mobile phone. Normal room lighting and no tripod. It's amazing what they will do these days, I don't think I could have got better photos with my "proper" camera! Pen-Y-Bryn now has a new owner, but before passing it on I said I'd touch up the ballast from the mouse-attack damage. On this layout, and some other layouts I have built, I have used an unusual mthod of ballasting to give a half-buried look and a fine ballast, suitable for narrow gauge lines, quarries and sidings. Now I don't claim it to be original, but I don't recall seeing it used elsewhere. The ballast mix contains plaster/pollyfilla, sand, and poweder paint mixed dry. I can't say the preportions as I mix it dry, but it needs to be about 50% plaster to stick properly. The sand came from the nearest beach and is quite coarse, and powder paint colours vary according to the effect required - normally a lot of black, with red, blue, and green mixed in. Here I wanted a greish colour that fitted with the stonework, cliffs, etc. The dry mix is then applied to the layout with a tea-spoon, often through an old tea-strainer to ensure no lumps of paint or plaster get through, and brushed into place around and between the sleepers with a cheap stiff paintbrush. It is built up around the track and may cover the sleepers a little, but that is the effect required in a quarry. Once in place I use a plant sprayer to spray the whole lot liberally with water that has had a squirt of washing up liquid added, that is to reduce the surface tension rather than make bubbles, if the water forms droplets add more washing up liquid or adjust the spray pattern. It helps to start spraying away from the layout to build up pressure, otherwise the first spray splatters. Once it is all well wetted more ballast mix can be sprinkled on to build up certain spots, and the process can be repeated as often as necessary. As always be careful around points, especially the tie-bars, and of course the track will need a good clean up afterwards. The rails should be painted before ballasting, but the sleepers get coloured with the ballast so I didn't bother painting them. The photo below shows the tools required - the teaspoon has some ballast mix in but the jar containing the rest is not in shot. In this case I had mixed more than required when I built the layout, and kept the leftover in a jar, which meant touching up the damaged ballast was just a case of sprinkling it on and spraying. The next two shots are supposed to show the dry ballast brushed into place, and the same after spraying with water. Not sure that it comes out, but I'm sure you get the idea! The same technique has many uses. I use the same mix with different preportions of sand and colours to make roadways, gravel or ash yard areas, and even in a smoother brown mix, use it to cover all the open areas of the layout as a "soil" base for grass etc. In that case it can be mixed with water before applying, in effect a textured and coloured plaster mix. 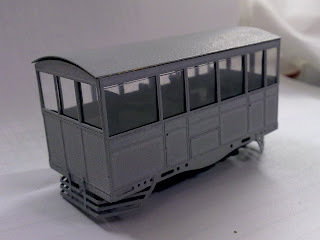 Over on his Blog Phil Parker is planning a new micro layout in a space 73 x 20 cm, or about 2' 5" by 8". Now that's not a lot of space in OO, however I like a challenge and I just can't help doodling track plans, so for Phil here are some ideas! Like Phil I prefer sketching out plans, as somehow track plans are very "organic", so I have simply inked over my sketches and scanned them in. I use squared paper and in this case 3cm to 1 foot, or 2" to each square. I've allowed for point lengths and clearances but these plans are just approximate, for any micro layout a full-size plan would be a great idea, using the Peco point templates (send them an SAE!) and actual stock to check clearances. You can even use boxes and card cut-outs to check buildings fit and appearance. Phil mentioned an Inglenook, which is a minimal shunting plan with 3 sidings, and often used as a puzzle. 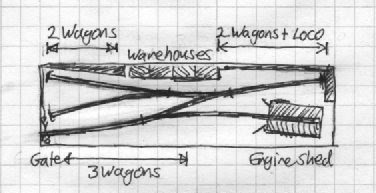 However to fit this plan I've used the reduced size with sidings for 2-2-and-3 wagons, and a headshunt for a loco+2 wagons. Even then I've suggested wye points to save space! I've sketched an industrial scene, the gate to the front left might lead across a road to the main railway yards. This system might be operated by small industrial locos, and for interest there is a small engine shed, although operationally it does not really feature. The next plan features a full-size inglenook, for 3, 3, and 5 wagons. However to achieve this an external fiddle yard is required, but that would rather defeat the point of building the layout in the box Phil has! So my idea is to hinge the yard such that it folds over the layout, when open a bridge could easily hide the hinge pillars. Using cassettes would allow the fiddle yard framing to be on top of the deck, saving height when folded into the box. I've added a kick-back siding again but this time run it under the bridge to suggest the end of a run-round loop, adding a little operational interest. Indeed a small platform could be squeezed in, OK a station is unlikely but perhaps an internal system running works passenger trains would be plausible, maybe a naval base? Another good basis for a micro layout is a locomotive depot, after all you're never going to run much in the way of a train in 73cm but if you like locos (and who doesn't?) this gives a great excuse to show off your collection without bothering with stock! This plan is a rather small depot, and like my Southon Yard 009 loco depot only the front of the shed is depicted (we want to park the locos on show!). I've used a coaling stage to hide the exit track, but if that seems a bit grand a works building of some kind would do - a wagon repair shop if you like wagons. However despite using a 3-way point, to allow reasonable space for locos on display there isn't really space for a fiddle yard, even though all that is required is a cassette for a loco. In fact the Peco Loco Lift would work a treat, even if just the end rests on the lead track. To support the other end of the cassette or loco lift perhaps the end of the baseboard could incorporate a telescopic or hinged arm! The final plan takes on another aspect altogether. Phil wants somewhere to pose locos and stock for photographs, which brought to mind those ex-works photographs seen in books where the new loco is posed on the works traverser ... hmm, how about a model works traverser! This plan is completely pointless (!) and features the traverser at the centre. Making it work could be a challenge! To the left are sidings to pose locos and stock outside the repair shops, for added interest the back siding could be the goods inwards loading dock. For a fiddle yard the same cassette system as the last plan is used, hidden by the erecting shop and a raised walkway. The local group of the N-Gauge Society hold an annual show not so far from me, and as they invite layouts in other scales too it is worth a visit. I have to say N gauge doesn't grab me, but then it is ideal for main-line trains and they are not my main interest. Having said that, London Underground is not an interest of mine either but the OO layout "Abbey Road" was superb, nicely detailed with a frequent service of colourful trains, great for my 2-year old too! My friend Simon Wilson from the Sussex Downs 009 group was exhibiting his layout Southwold, based on the 3' gauge line that once ran to Southwold. Simon uses 009, which feels in keeping with the small stock the line used even though by rights it should be 12mm gauge, and runs various loco's and stock as well as models of the line's original stock. The relatively large area of the layout has been used to give feel of the train in the landscape, and getting down to eye level to look across the fields to the next station (there are 3 on the layout!) there are some great views. Simon was awarded the Best In Show trophy - well deserved I say, even if the gremlins had been attacking the running (board joints need attention!). Although I have seen the layout before I took the opportunity while there was good light, few people about (well, less than EXPO!) and my toddler was distracted (!) to get some photos. You can see more photos from the show and of Southwold here.